This groundbreaking work revisits the narrative of one of the greatest tragedies of the twentieth century. When Martin Luther King Jr. was brutally assassinated on April 4, 1968, a worldwide manhunt began. James Earl Ray, apprehended two months later, pled guilty to avoid the death penalty and spent the rest of his life fighting for a trial by jury. He claimed that he was set up to take the blame—a claim that the King family supports. Drawn from interviews with attorneys, Ray’s family, and Ray himself, this revelatory book exposes the deep corruption and dark machinations of the House Select Committee on Assassinations’s investigation into the murder. Affidavits from those present in the courtroom reveal that evidence was altered, condemning Ray to a life of imprisonment and public condemnation. These new insights reveal a fatal flaw of our justice system and the truth about a wronged man. John Avery Emison is an environmental scientist who has worked as a science reporter for the Oak Ridge (TN) Oakridger and as an editor of a business newspaper in eastern Tennessee. He has a keen interest in Southern history and constitutional law. Emison graduated with a BA in liberal arts from Union University, MS in physical geography from Memphis State University, and PhD in resource geography from Oregon State University. He resides near Jackson, Tennessee. 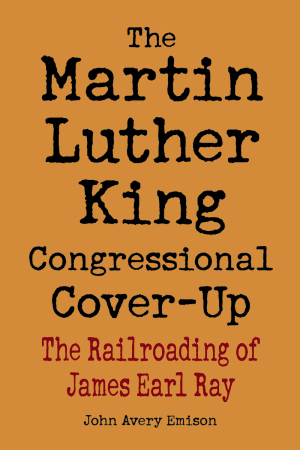 Did James Earl Ray kill Martin Luther King Jr.?